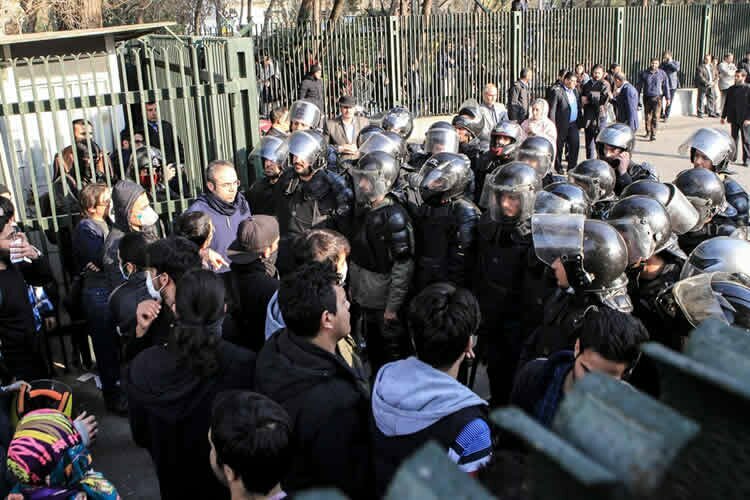 After the 2009 protests in Iran, which saw the participation of a large number of students, the Iranian government shut down all student associations as a way to control students and universities. In a rigorous program, the government also decreased the number of independent students by increasing government quotas in universities to the point that as of 2011, mostly designated students entered universities. Therefore, the first three categories have a priority in entering university even if they score much lower than other students on the Nationwide University Entrance Exams which are very competitive in Iran. Since 75% of the university is made up of people affiliated with the government and paramilitary forces, virtually any activism in the university is immediately quelled. For example, a female student of Alameh University who was detained for giving a speech on Student Day 2016 was sentenced to one and half years of prison and a two-year travel ban by a court of first instance. In the past few months, there has also been a 5% increase in the quota for the families of veterans and those who volunteered at the war front for at least six months. Therefore the quota for the so-called “Isargaran” which literally means the “Givers” or “Those Who Have Sacrificed”, a term used for war veterans by the regime, has now increased to 30%. There are currently 19 shares in the Nationwide University Entrance Exams and in some subjects, some of the categories mentioned above are given more than 50% of the quotas in those shares. This issue has greatly compromised the credibility of the Iranian scientific community. In the medical and dental assistant exams, the admission rate for non-quota volunteers is only 35%, and the rest is allocated to those affiliated with the Bassij and Revolutionary Guards Corps. A recent announcement has been sent to all public universities to attract foreign students at the master’s degree and Ph.D. levels. Accordingly, despite all the problems that Iranian students face, universities are required to bring foreign students from countries such as Iraq, Afghanistan, Syria, Lebanon, Palestine, Yemen, Pakistan etc. These students can, in turn, preach the culture of the Islamic Republic of Iran in their own countries and are obviously supporters of the regime. They are given scholarships while their tuition, dorm expenses and other educational facilities are all paid for by the Iranian government. The government also supports their ideas and thoughts about the Islamic revolution and the founder of the Islamic Republic. Obviously, elite Iranian students do not receive such facilities. Most engineering and medical sciences majors require hands-on facilities and related laboratories and lap supplies. Another serious issue that Iranian universities face is that almost all university units in the country lack such facilities. According to an order issued by the Supreme Leadership Organization which has been communicated to all sub-sections of universities, Sunni students and students from other religious minorities should be fully segregated from Shiite students, and any of their religious programs or activities should be approved and receive a permit by the Supreme Leadership Organization and the University Security Organization. Accordingly, any Sunni congregational prayer is strictly prohibited, and Sunni students are not permitted to perform prayers or special religious programs in the dormitories or public areas of the university. According to an order that was issued and communicated to all faculty members and academic groups, books and educational textbooks have to receive permits in order to be used in the curriculum. This is even more vital for officials when it comes to subjects dealing with the humanities and arts. Recently, according to a chart issued by the Ministry of Science, Research and Technology (the ministry of higher education), certain frameworks have been introduced in relation to the use of textbooks by professors, which indicate a growing fear by senior officials and their obligation to create an atmosphere consistent with the values ​​of the Islamic Republic. Unfortunately, from the beginning of the new academic year, student Bassij Organizations have been trying to secretly attract and recruit students with extremist leanings as so-called Holy Shrine Defenders. The government has put a lot of effort into bringing students into the Shrine Defenders as it would serve its propaganda giving the issue an academic aspect and putting the weight of the university behind it. It would serve in the best interest of the government if it could somehow convince the public that university students are also members of the Shrine Defenders. Fortunately, this project has failed at the university level. A very large amount of CCTV systems were installed in universities during the summer. They were even installed in parks and other recreational areas. Cameras have even been installed in university busses which has led to an intense security atmosphere. According to an informed source, hearing devices have even been installed in some crowded areas. Large mysterious antennas have also been seen in many universities. In university internet cafés, students who want to use the computers are given a specific time limitation and have to punch in their student card and national numbers into the computer. CCTV cameras have been installed in all of these areas and all students’ communication and internet use are tracked and controlled. The university Wi-Fi, which is free of charge, can only be used once you receive a password for which you have to give your student card, national card number, or the serial number or MAC address of your cellphone, tablet or laptop. Recently, another order has been issued banning the entry of any personal vehicle belonging to students, professors, and staff. Even taxis are prohibited, except with the permission of the Security Organization and a transportation card. Accordingly, university professors and staff must register their vehicles and receive a transportation card to enter. Apart from the official vehicles of the university, no other means for transferring students is allowed to enter the university, and those who do not abide by this rule are dealt with. Any photograph or image and symbol contrary to the standards of the Islamic system in the dormitory environment is strictly forbidden and subject to punishment. The use of unauthorized music is prohibited and subject to punishment. Clothing that officials deem as not conforming to Islamic values is forbidden. Students must inform the dorm management to travel to an area outside of the dorm area. Nonstudents are banned from entering the dorm unless coordinated with the dorm management. Any gathering in the dormitory environment is prohibited even for a birthday party except with a permit from the dormitory management and the University Security Organization. Female students have to be completely veiled at all times in the dorm area and any kind of contact with the outside should be with the knowledge of the dorm management. During night hours, women are only allowed to use taxis confirmed by the dorm management. Any kind of cultural or religious ceremony in the dorm area is prohibited except with the permission of the University Security Organization and with the presence of their representative in the ceremony. Sunni students are strictly prohibited from holding congressional prayers. The presence of Sunni clerics in the dormitory environment is illegal except in the presence of a representative from the Security Organization. The presence of political, cultural and artistic individuals or activists is prohibited except with the permission of the Security Organization and the presence of their representative.